"...I recently had a stroll around my local zoo at Twycross and was interested to see that they had started cloning a variety of extinct species, including the Thylacine, Dodo, Velociraptor, Mammoth, Sabre toothed cat and Pteranodon to name a few. 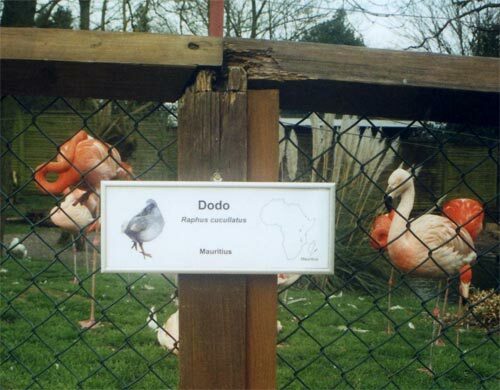 Here is the dodo sign that I found at the zoo, though I am unsure what version of dodo they have on show. In the background they can be seen as tall flamingo look-a-likes. It could be possible that any more dodo-like species could have been hiding in the same enclosure, but it is difficult to say..."